Question By @Mew#5835leon#3378: What have you learned and gained from developing a very popular discord bot and how does it impact you now? Answer: I’v developed a few other things in my life that were quite popular online. And now I think I’m in the perfect time for this project, after gaining a lot of experience with communities of my previous projects. This project has been a bit different, because I can very well see it last for a long time. Now it impacts my life a lot. Every day I always do something related to it, even if I’m not programming. I try my best to be active in this server, at least in the support channels that are related to development. Listening to the community is something I believe has so much value for a successful project. I feel like “Pokéverse” is much more than “just another Pokemon Bot”. I believe in pushing it as far as possible and make it as good as possible. Making a fun bot is 50%. The other 50% is the way the developer/s interact with the community and make the world feel alive and not static. Update it often, implement user requested features, make events that users can participate in real time, be open to the community with plans and progress, and so on. And we’ll try our best to achieve all of these things right. Question By @Cuckoo#8524: What new ideas, or things are you working on? Also, what do you plan to do for upcoming Christmas? Something similar to the Halloween event or something more unique? Question By @Shark#9776: Where do you see the bot going and is it what you originally planned for? Are you happy with where it is? And is there anything you regret about the bot? Answer: I would like to see the bot continuing it’s amazing growth, as long as I see that the bot keeps growing, I’ll keep updating it. And the staff and I will do our best to make it stay this way for as long as possible! Yes, I’m very happy with the current state of the bot, I feel like we have achieved a lot in this short time, more than many others have managed to do. I feel like me and the staff has handled the community and the bot really well so far, and we will keep doing. I don’t think I regret about many things, and the ones that I do, they are now mostly fine! Day 1: Sitting in my chair all day typing !S, !S, !S trying to spawn a rare. Spawning common after common. Eventually I just give up. I type word after word. Crossing my fingers, hoping to spawn a raider. My days are breed, breed, breed and I can never breed a single rare. Later I go back to typing !S, !S, !S trying to spawn a shiny or lucky can’t even spawn level fifty Pokémon. I just finished my season pass and got my shiny female Diancie. My last challenge before I got it was “Catch a lucky Pokémon” I didn’t know what I was going to do because I had been trying to spawn a lucky for three days strait and hadn’t seen a shiny or lucky. Luckily Chris had just spawned one and let me have it for free. A few weeks ago, Chris even gave me a Regice for a Groudon. I bought a few redeems a month ago and used ten of them for the season pass fifteen of them trying to get a fem Kyurem and I got one. Then I used five of them to try to get a fem Melowetta and I got a male. During season two I traded a fem Volcanion for a fem Magearna. I was so happy that a got a fem Magearna for a Volcanion which you could spawn in the season’s region. When I first started Pokeverse it was when it was still called Pokemoin. A nice guy named HexaK41n gave me a few fem rares and a few male rares. I’m part of a Pokeverse business called Service Verse we breed Pokémon for others. We also level up Pokemon, catch Pokémon, and spawn Pokémon for other people. I’ve started a business getting requested shinies for people that are clvl 200+. Day 2: Today I’m buying fem ultra rares or Unobtainables. I’m hoping that Tbj increases the breeding rates again. I bred forty seven fems more than three times and have gotten zero males and zero fems. 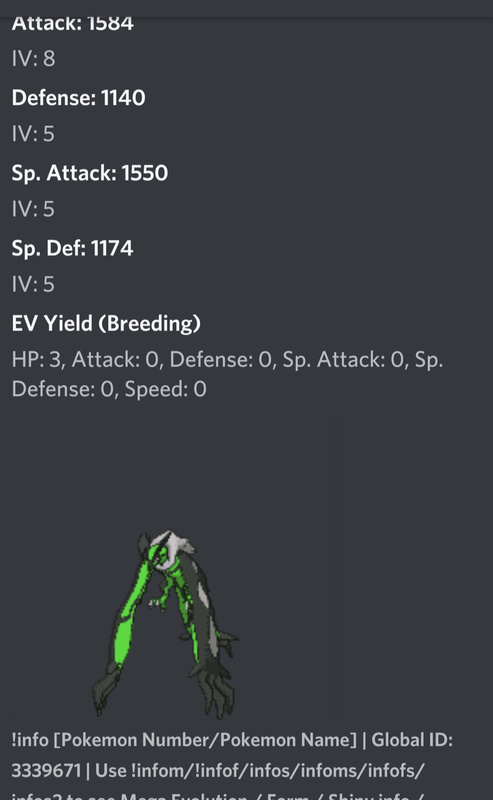 Right now, I’m breeding a Decidueye for a friend who is paying 200k for a clvl 200+ and shiny. Yesterday I was typing !S, !S,!S,!S, !S again and again. Eventually I gave up because I couldn’t spawn anything. Not a shiny, not a rare, and not even a lucky. So I started trying to spawn a raider typing word, after word, after word, after word. Nothing spawned the past few days. I’ve been working on my server for the past few days. Giving the members of my community new quest and new adventures daily. Giving the members things to do to increase how much fun they have with the bot. In addition, increasing how much adventure my members can get out of the bot. 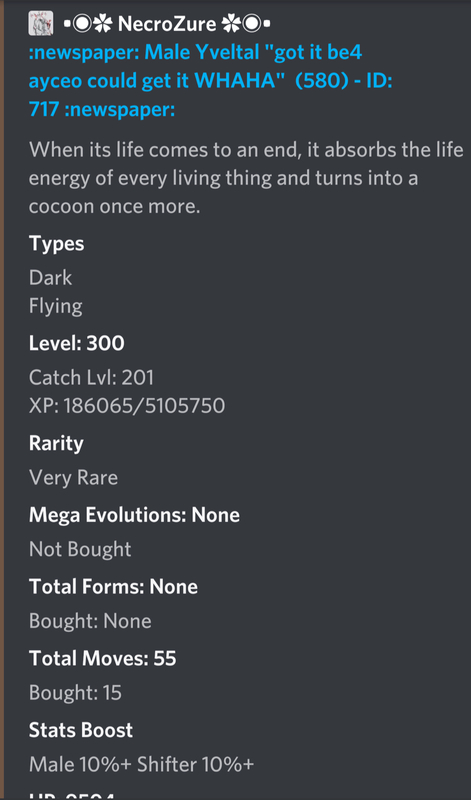 I just got a job from Ranger for a shiny shelder with some IVs for 500k. I’m really excited about the new weekly newsletter where things from different players are included in the newsletter. Day 3: Today was another day of failed attempts breeding and spawning. I spent hours today typing !S for hours and hours. It was a never ending loop like it always is. Then I went on trying to spawn a raider and went through the process again typing a word, then another word, then another word, and then I’ll finally give up and go talk to Res and Chris. I usually talk to them for about thirty to forty minutes. Pokeverse adventures helped me make a bunch of new friends such as Res, Chris, HexaK41n, Ranger, … , Parfate, and Layla. They have made my adventure in Pokeverse so much more enjoyable. They have given me things, they have traded me, they have taught me, and they have trusted me. They have lead me through my adventure they have helped me spawn things and to beat gyms. I wouldn’t be as far as I’m without them. Chris taught me the most about the bot and how to get stronger. HexaK41n taught me the most about breeding and how to help other learn and get better at the bot. Ranger has been one of my best friends helping me grow my discord channel and add more to it. Last but not least Parfate he is the boss of Service Verse he has taught me a lot about helping others and we have earned a lot of money together in Service Verse. In conclusion I’ve had a lot of fun playing Pokeverse and I’ve come a long way and I’ve made a ton of new friends who I hope I can continue my adventure with. So l started my “adventure” of pokeverse in one of my friend server. For the first time l didn’t knew how to play or even how this bot works. But after couple days l learned some basic stuff a nd l managed to catch my first pokèmon. Galvantula clvl 120. I was pretty happy because l had better pokèmon. But of course it was not the best pokèmon because we have even stronger ones. After l caught my Galvantula l decided to exp and exp and exp. My first region l decided to “clean” was “embrace the darkness” because l wanted to catch some easy rares there such as Necrozma or Mew. To be honest l managed to catch necrozma only at “light dome” location because there was only him and most likely higher chance to spawn. After necrozma l get Reshiram. All of them fem. There was couple days when l was grinding and grinding. Then l decided to join Immortal Guild because l really liked people in it. I DM Rheaper then Seongye DM me about joining Immortals. After all this stuff l was accepted and got in “Immortal Guild” l was pretty happy because l meet many awesome people like Muapa or Yum and many more. After 2 days there was a giveaway to get all rares from inventory from one person (forgot his name). I win it surprisingly and l get around 30 rares or more. Including some unobtainables. I was surprised and happy at the same time. After couple days l was breeding and breeding and breeding all the time until l get a fem rare. I managed to breed fem Kyogre and other poks such as Zeraora. Now let’s move on to main server of this awesome bot and developer. I was helping with gyms and sometimes helping other people how to play and stuff. I was explaining basic stuff. I still helping my friend like how to get some good pokèmon’s and which region is good for farm. I even gived them some of my male rares with decent clvl and IVS. On this bot lm trying to be friendly and helpful however l had some times when there was a person disrespecting me etc. And l had to report them (talking about different server). Lucky they never was in official one. After all l decided to gamble so.e gold with user called Pokemaster. First gamble l won like 5 million. The nest gambles was like 10-20 million. I was winning all the time and losing. I lost like 2 times or idk. After all gambles l get 50 million and l decided to buy female kyurem because l could get more gold by selling him. After couple days l decided to make a new thing called “poke lending” where we lend specific pokèmon’s and breed them for our self. It must be fem of course. This action is still going on since its hard to breed rares sometimes. After this l was breeding and doing z-move service because l needed some gold. After that l was doing level service of arceus. It was very easy since arceus is good pokèmon for beginning players to be honest. The rest of my adventure is mostly exping and catching. But l can say that l managed to get Fem: Rotom, Giratina, Articuno chat spawn and l was very happy. These were my first chat spawn. I saw when my friend overspawned Magearna chat spawn by accident and I was pretty mad tbh. Last week l was farming raiders on pokeverse server. I managed to kill around 4 raiders. Because l was “hunting ” for them all day. When l had like enough candies to get lucky or possible rare l get genesect. I was surprised however it was male sadly. I decided to get another candies by doing raid. I traded my kyurem clvl 63 for higher clvl and l buyed celesteela for 5 million with decent IVS and clvl. Right now lm trying to breed shiny celesteela so l can sell it for big ammount of gold. Right now I’m preparing for new “season” thing this Friday. Whatever season is l hope this will be worth doing location or whatever this will be. Soon after all this stuff moded server of pokeverse arrived hosted by Tbj. My opinion was like “why pay for 1 month of custom server to play with one friend” for me this is not worth buying to be honest that’s all l was thinking. After 3 hours l decided to check what poks l have to breed. I breed fem diancie and l get fem baby diancie with decent IVS. But still. There is nothing much in my story since the rest of stuff goes like spawning and spawning then spending gold. Now about candies part this is genesect l get. In a land of lights and money lived a man named bobsaget. He had a small passion for gaming. He played mobile MMOs with gatchas that drew out thousands of dollars from his accounts monthly. Until one day he discovered a new beginning “Discord Bots”. 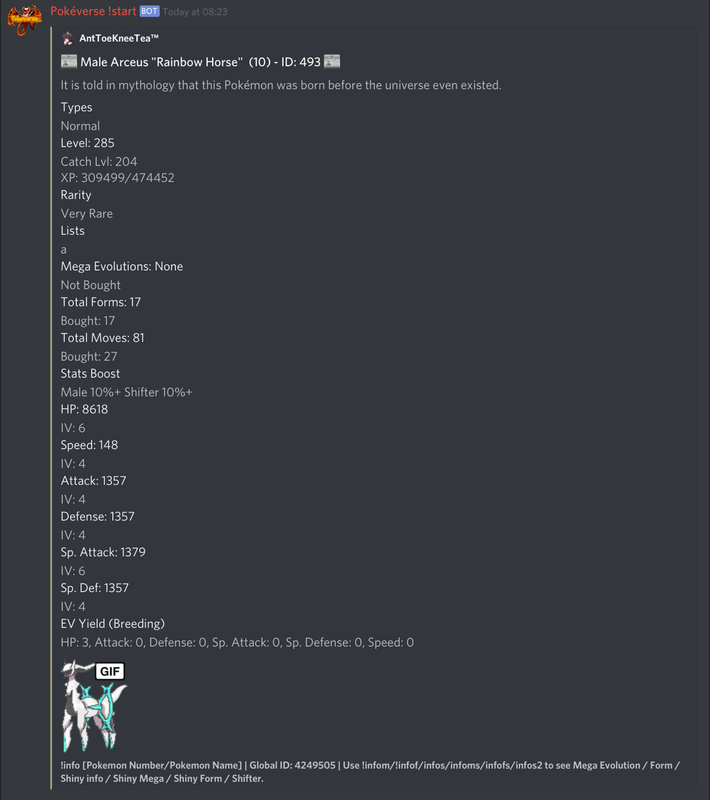 He tried to get into Haku, Tatsumaki, Mantaro, and even Pokecord…yet all felt short and left him scratching the gatcha itch like an addict looking for his next fix. One day a friend of Bob’s told him about a bot that was going thru growing pains but had potential unlike any other he had seen. This was the first Bob had heard of this bot with a weird funky ungoogleable name, “PokeMoin”. Just like with anything bob does in his life he jumped in face first exploring the ins and outs arguing with mods and developers about simplistic nonsensical shhh…stuff. First and foremost he understood that his goal must be to reach level cap. So he structured a plan of catching rares and negotiating and developing a small group of buyers for rares of low level. At the time the bot had no regions or ways of isolating certain pokemon from one another. All that was out there was a big ocean of pokemon and everyone had a mad struggle to collect them all. Collecting rares proved not to be an issue; clearly luck was on bob’s side and he had amassed enough funds to achieve his goal: Reaching level Cap. With a primary objective achieved he started latching down the windows and constructing his next master plan. Bob wanted rares and he wanted them high level. He struggled with hours and hours of non stop grinding losing sleep and depriving himself of food. The hours paid off at times with big catches and personal achievements that kept him satiated like food never could. As Bob grew in his fondness of Pokemoin so did the game developing around him. Every week the developer would not stop with the enhancements, the tweaks, and the content . He assumed the likeness of a horse with blinders on; with danger seeming to want to cut the bot at the knees around every corner with glitches and exploits the dev moved forward at an uncanny speed unseen by his peers. The bot was growing like a baby bird that got kicked out of the nest at a great height. Slowly an expansive abyss of pokemon randomness dissolved into a structured regional system with 100s of areas to catch specific creatures and to hunt elusive rares. Bob had taken time to grow and invest countless hours into this new game by this point. He had teams structure by types, collections by rarities, level capped poks, and many things that at this day and age doesn’t quite seem as relevant. The growth was uncanny and unprecedented by any bot before it. No sooner had one thing been implemented with fluidity and righteous exuberance, that the next was on the board to be implemented. Bob had started communicating with the dev at this point. He wanted to be involved to some point with the development of this bot he was unsure to what point. Bob saw the gleam in the dev’s eyes as he spoke of moin and defended it against critics and competitors. Bob felt the comradery like see a fellow dad defend their child from an overbearing teacher. At once Bob started brewing with helpful ideas. He wanted to be there, he wanted his virtual bot daddy friend to succeed. Not long later bot daddy had made bob a mod. While the story can have turns and drama, comedy, sadness, and horror. The truth is the story of Pokemoin(now Pokeverse) and bob is no where near done. Since the start of their relationship bot daddy, Bob,and Pokeverse have seen drama like no other with raiders from the isle of Zoloman. Have seen glitches that caused folk’s inventories to devolve into unowns. Bob has seen glitches that randomly duplicate gold to infinitesimal decimals. With all that drama Bob and Pokeverse have always stood side by side. 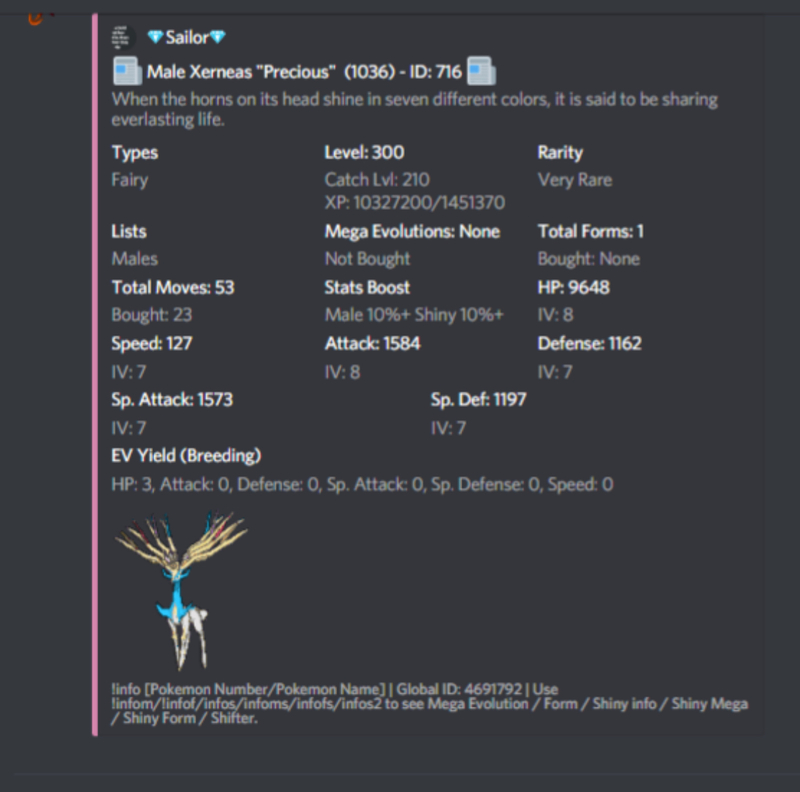 The glorious and victorious release of breeding and being the only bot on Discord that had that. Bob remembers watching proudly as the pokverse market came up for the first time to the amazement of many and the astonishment of few. The implementation of an IV/EV system that was basic yet challenging and worthy of being put into the goal book. Essentially Bob saw a bot start from a one trick pony and develop into a multifaceted eco system of amazingness that he cares for and adores. This was not simple gatcha mmo that one could throw away and move on. This to Bob was a new world that was growing right before his eyes. A world of endless possibilities and multiple storylines that only needed to be accepted and pursued.